Sea Scouting is a division of Venturing which focuses on teaching Scouts marine and sailing skills. Venturing is a youth development program of the Boy Scouts of America for young men and women who are 14 (and have completed the eighth grade) through 20 years of age. The purpose of Venturing is to provide positive experiences to help young people mature and to prepare them to become responsible and caring adults. Today’s Sea Scouting started in 1912 and has a long and colorful tradition. Thousands of young men and women have had the opportunity to follow the traditions of the sea while learning what the future holds for a career related to the sea or a lifelong hobby of recreational boating. Many Sea Scout ships maintain sail or power vessels; follow a challenging rank advancement program; and have nautical uniforming, customs, and ceremonies. The program of a Sea Scout ship is based on matching the interests of the members with the skills, equipment, and resources of the chartered organization. Most ships follow the traditional advancement program found in the Sea Scout Manual. The ship’s program follows the customs and traditions of the sea and encourages members to earn the ranks of Apprentice, Ordinary, Able, and Quartermaster (equivalent to the BSA Eagle rank). The top person and the key leaders invite these prospective adult leaders to an organizational meeting. 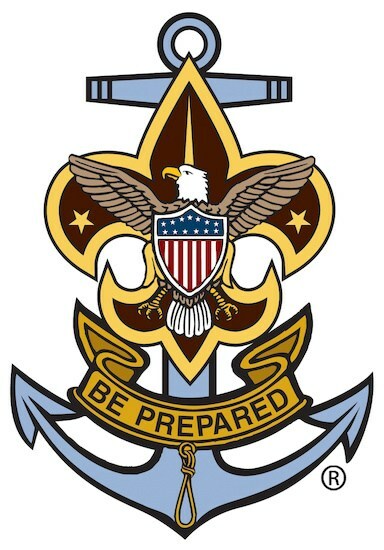 The purpose, program, and leadership of a Sea Scout ship are reviewed using the Sea Scout Manual. Venturing leader basic training sessions are scheduled following the outline in Venturing Leader Specific Training. Sea Scout leaders’ specialized training, found in Sea Scout Officers’ Specialized Training Instructor’s Guide, is also conducted. After these training sessions are completed, the organizer guides these prospective leaders to select a Skipper, two or more mates, and the ship committee. The organization’s top person is involved in this selection. The job descriptions for these positions are found in the Sea Scout Manual. The first ship meeting (called an open house) is carefully planned to provide an exciting program to attract prospects to join. “Hands on” maritime activities could be featured. The ship leaders review the schedule of meetings and activities along with the structure, activities, and advancement opportunities in Sea Scouting. Leaders and members from nearby ships may be invited to help. All new ship members should purchase a Sea Scout Manual. Sea Scouts must be 14 years of age and have graduated from the eighth grade and be under 21 years of age. The organization determines if its membership is coed, all-female, or all-male. The Skipper trains the new officers using the Sea Scout Manual and Handbook for Skippers. A year’s schedule of meetings and activities should be developed avoiding any conflict with school, church, or community events. Greetings from the host (Head of Chartered Organization) Express the chartered organization’s interest in youth and enthusiasm for Venturing. It is important to coach this individual in the use of proper Venturing terms and not to say “Venturer Scout,” etc. Reassemble small groups. (Skipper) Explain the national registration fee, which includes participation in local and national Venturing activities. Have copies of the Sea Scout Manualfor display or purchase. After ship meeting: Skipper conducts officers’ briefing following outline in the Venturing Leader Manual, No. 34655C. Program Content. The following program outline has been developed as a suggestion for a new ship just getting under way. It is based on two meetings a month of the entire ship, an officers’ meeting (quarterdeck), plus an activity or field trip. It can be modified or adapted to fit the needs and interests of members and leaders. It is also assumed that May is the first month. Modify the program accordingly for beginning in other months. In some locations, council and/or area Sea Scout events are conducted. These dates should be included in the ship’s calendar. Ship Meetings—”Open House” to recruit new members. Cover the basic organization of the ship, election of officers, orientation on Sea Scouting, and the planned program for the first three months. Ship members and leaders should determine uniforms or ship identity items such as T-shirts, jackets, etc. Quarterdeck Meeting—Review duties of the officers; acquaint all with calendar, training courses, etc. ; prepare for next month’s ship meetings and activity. Ship Meetings—Safe boating course, three two-hour sessions; hold orientation sessions on ship organization and duties of the commissioned and elected officers; practice “coming aboard” and a few simple ceremonies; start learning the language of the sea (Glossary of sea terms). Quarterdeck Meeting—Review ship meetings and their effectiveness; plan outlines of “formal” and “informal” ship meetings; check on arrangements for planned activity; prepare for next month’s ship meetings. Quarterdeck Meeting—Critique meetings; check on programs, activity, etc. ; prepare for next month’s ship meetings. Quarterdeck Meeting—Critique meetings; check on program committees, coming activity, etc. ; prepare for next month’s ship meetings. Ship Meetings—Orientation in marlinspike seamanship (rope work); practice sessions in knots and knot tying; classes in advancement subjects; contests in knot tying; plan next three months’ program, make assignments, etc. Ship Meetings—Continue marlinspike seamanship; instruction in special knots, clinches, straps, lashings, seizings, worming, parcelling, servings, whipping; practice sessions; preparation for parents’ night and bridge of honor. Activity—Holiday party, parents’ night, and bridge of honor. Ship Meetings—Continue marlinspike seamanship; instruction in tackles, purchase, and blocks; practice sessions; skill-teaching contests; plan next three months’ program, make assignments, etc. Activity—Sailing instruction, Valentine’s Day party, or ship banquet. Ship Meetings—Sail training plan continued, piloting; skill-teaching contests; ship inspection and drill; plan three months’ program, make assignments, etc.